These cute little skewers are definitely one step up from the old cheese and pineapple sticks that you used to find at parties. Fresh figs are combined with baby mozzarella balls, prosciutto, basil and balsamic vinegar to create a wonderful nibble that really epitomises the flavours of Italy. 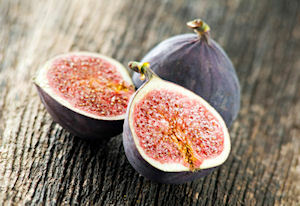 Slice the figs into quarters and place into a bowl with the oil and vinegar and a good pinch of salt and pepper. Leave for one hour. Thread the skewers with one wedge of fig, 1 basil leaf, 1 mozzarella ball and half a slice of prosciutto. Thread them in any order you choose. Once all 16 skewers have been made, drizzle them with any remaining marinade from the figs. You don't have to use baby mozzarella balls - simply rip up buffalo mozzarella and use a piece on each skewer. This recipe serves 16.